Let’s pull one out of the ol’ vault, shall we. Here is a crazy beer released by a bunch of crazy people over at Pipeworks Brewing Company from Chicago, IL. After I received this beer in a purchased box sent to me by my good friend, Jorge Espinoza of animebeers.com, I immediately drank it. Posting this beer review though, got lost, and time and time went by, and now here we are now, posting this review up as part of my Retro Review series. The one thing I love so much about Pipeworks Brewing is that they pull no punches when it comes to creativity with the ingredients within their beers, and the drawings on their labels. 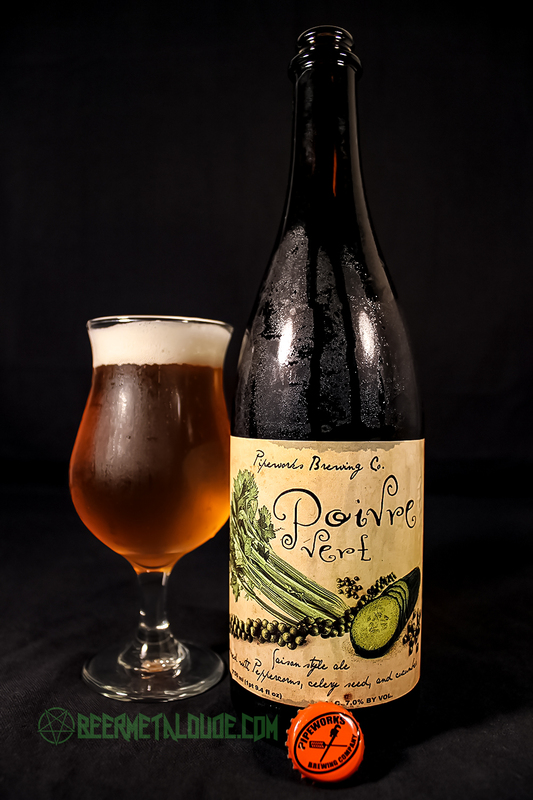 Well, this one is definitely creative with the actual beer, a Saison brewed with added green peppercorns, celery seed, and cucumbers. A few year ago when I first had this beer, there wasn’t many beers in the market with such adjuncts. The label, while not being wild and crazy, speaks elegance and all fancy schmancy and stuff. The whole label is featured on an old paper texture, and has fancy handwritten script fonts all over this thing. Full celery stalks, green peppercorns, and a sliced cucumber is drawn on the label. So there are no skulls, ninjas, unicorns, aliens, or anything else we usually see on a beer from Pipeworks. This one is just plain, and looks like a salad prep table. Poured into a tulip glass, Poivre Vert’s appearance was a hazy dark golden color, which was topped with about a 1-inch wide white foamy head. Great head retention with thin web-like lacing left down the glass. I was really excited to see what this beer would smell and taste like. The aroma of Poivre Vert met most of my expectations. As a Saison there was a musty farmhouse aroma, blended quite nicely with the added cucumber, which was pretty dominant in the nose. What I did enjoy was the fading tail end of each whiff, as that’s where I would get the celery and peppercorn. There was an added spice, and earthiness there that well rounded the aroma. The taste was exactly what I wanted from this beer. All the said ingredients were present and accounted for here. Just as the aroma was, the Saison base had it’s musty farmhouse taste with a fantastic blending of the added ingredients in this beer. The cucumber was the dominant flavor here, with the celery seed and peppercorn showing up at the end of each swill, which added a nice spicy, earthy, vegetable-like taste. The taste of this beer was complimented by a medium body with mild carbonation. The mouthfeel was smooth and creamy, but had a spicy (not hot spicy, but you know, spicy) and dry finish. Overall, this was a very unique beer in all aspects. Aroma, taste, and body all made this beer feel as if I was just eating some vegetables or salad. I remember when I first heard about this beer, and was so intrigued that I had to get is as soon as possible. I feel bad that I never posted this review when I actually had this beer, which was back in May 2014, but for those of you who follow my site, you know this is normal for me. So, I hope you enjoyed this trip down memory lane, and for any of you who still have this bottle, I’d like to know hoe well it held up. Cheers! Metal Connection: I thought it would be hard to find a Metal Connection for this beer, as I am sure there are no songs about celery or peppercorns, but I did actually find something that I thought is a perfect fit here. How about an excellent jazzy instrumental by none other than the Masters of Metal, Black Sabbath. 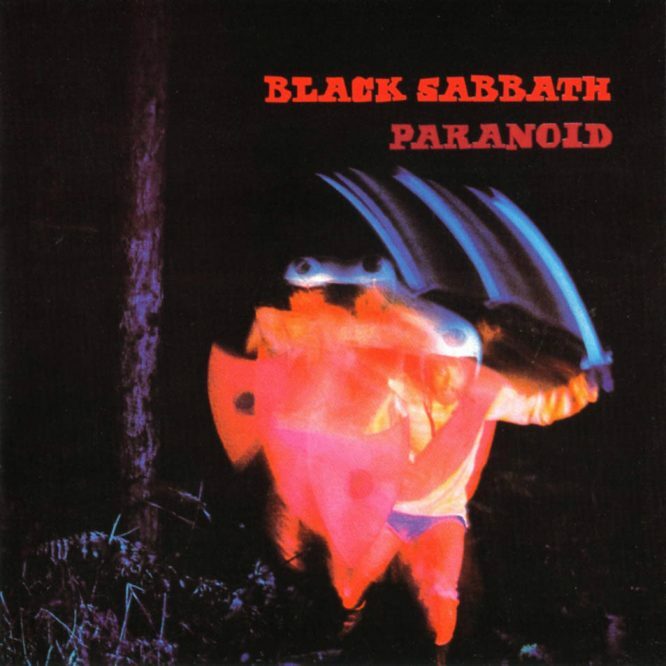 Back in 1970, this legendary band released their second full length album, Paranoid. This gem included some Heavy Metal classics like “War Pigs,” “Paranoid,” “Planet Caravan,” and “Iron Man.” The other 4 songs on this album might not have been on the radio much, but are all considered iconic songs just like the ones mentioned above. One of those songs is a two and a half minute long instrumental called “Rat Salad.” I went with this song for obvious reasons. It has the word salad in the name, and this is the best way to explain this unique beer by Pipeworks Brewing Company. This song really let’s their drummer, Bill Ward shine. I love the Underground Black/Death/Grindcore scene the most, and drummers now a days are about speed, and I hate to say it, over produced artificial sounding. As Black Sabbath pretty much introduced the world to Heavy Metal, there is so much Blues and Jazz influence in their playing, and the simple guitar work, with Ward’s awesome drum solos throughout this song really shows this. So crank this baby up, get your fingers ready to air drum along to this killer track. Enjoy your beer and Metal.